The NBA and the National Basketball Players Association jointly announced Wednesday that they have reached a tentative deal on a new Collective Bargaining Agreement (CBA), pending ratification by both team owners and the league’s players. In order to give both sides enough time to review the terms of the agreement, hash out a new CBA, and hold their respective votes to ratify it, they have agreed to extend their mutual deadline to opt out of the existing CBA from Dec. 15, 2017 to Jan. 13, 2017. The new collective bargaining agreement will extend seven years, covering the 2017-18 through 2023-24 seasons. 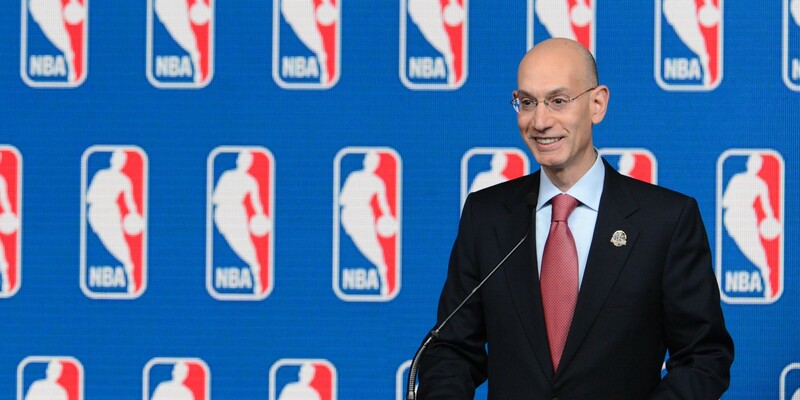 Bot the NBA and the players association will have the ability to opt out after six years, following the 2022-23 season, by exercising their termination right no later than Dec. 15, 2022. The split of basketball-related income (BRI) between the league and players will remain the same as in the current deal, which calls for the players to receive between 49 percent and 51 percent, with the range dependent upon the amount by which league-wide revenue falls short of or exceeds initial projections. Due to the massive $24 billion national television rights contracts between the league and its national partners (ABC/ESPN and TNT) that have now kicked in, players will be virtually assured to receive the full 51 percent throughout the life of the new deal. The baseline salary cap structure will remain the same in the new agreement, including the calculation of the salary cap, the calculation of the luxury tax, tax penalties for teams crossing the tax threshold, and transaction limitations for teams crossing the apron. The apron calculation will however change in the new deal. The apron – the amount above the luxury tax that cannot be exceeded by any team that uses the Non-Taxpayer Mid-Level Exception or Bi-annual Exception, or acquires a free agent in a sign-and-trade – will be slotted $6 million above the tax line for 2017-18, an increase from $4 million in the current deal, and will increase or decrease thereafter at a percentage equal to one half of the percentage increase or decrease in the salary cap. The three maximum salary tiers will remain the same in the new agreement: players with 0-6 years of service can receive 25 percent of the salary cap (a Tier 1 max), players with 7-9 years of service can receive 30 percent of the salary cap (a Tier 2 max), and players with 10+ years of service can receive 35 percent of the salary cap (a Tier 3 max). The calculations of max salaries, however, will change in the new agreement. While the salary cap calculation utilizes 44.74 percent of BRI as the basis for its calculation in both the current and new agreements, the salary cap calculation upon which the max salary tiers are applied utilizes a slightly reduced 42.14 percent figure in the current agreement. In the new agreement, this difference will be eliminated. Max salaries will now be tied directly to the salary cap itself. That will make max salaries much easier to calculate. But it will also boost them by around 6-7 percent. As a result of the change, max salary projections for 2017-18 will increase as follows: the Tier 1 max increases from $24 million to $26 million, the Tier 2 max increases from $29 million to $31 million, and the Tier 3 max increases from $34 million to $36 million. The Mid-Level Exceptions (Room, Taxpayer and Non-Taxpayer) and the Bi-Annual Exception for 2017-18 will increase by 45 percent in the new agreement (relative to the 2017-18 figures in the current agreement). The Non-Taxpayer Mid-Level exception will increase from $5.8 million to $8.4 million, the Taxpayer Mid-Level Exception from $3.6 million to $5.2 million, the Mid-Level Exception for Room teams from $3.0 million to $4.3 million, and the Bi-Annual Exception from $2.3 million to $3.3 million. Starting with the 2018-19 season, each will rise or fall at the same rate as the salary cap. In 2017-18, the first-year salary in all rookie-scale contracts will be equal to those in the current agreement. The second- and third-year salaries in all rookie-scale contracts will increase by 5.0 percent of the salary in the first year of the rookie-scale contract. The fourth-year salaries and qualifying offers will increase by the same percentages dictated in the current agreement. From there, all 2017-18 salary-scale amounts will be increased by 15 percent, all 2018-19 salary-scale amounts will be increased by 30 percent, and all salary-scale amounts for 2019-20 and beyond will be increased by 45 percent. Starting with the 2018-19 season, the first-year salary in all rookie-scale contracts amount will rise or fall at the same rate as the salary cap. The second- and third-year salaries in all rookie-scale contracts will increase by 5.0 percent of the salary in the first year of the rookie-scale contract. The fourth-year salaries and qualifying offers will increase by the same percentages dictated in the current agreement. From there, all 2018-19 salary-scale amounts will be increased by 30 percent, and all salary-scale amounts for 2019-20 and beyond will be increased by 45 percent. First-round picks can still sign for between 80 percent and 120 percent of their scale amounts in the new agreement. For all of these contracts, salaries for 2017-18 will be increased by 15 percent. For contracts which began in 2015-16 or 2016-17, salaries for 2018-19 will be increased 30 percent. For contracts which began in 2016-17, salaries for 2019-20 will be increased 45 percent. In cases where the post adjustment salaries are still below the applicable minimum salary (see “Minimum Salaries” below), such rookie-scale amounts will be increased to the minimum salary. The increases will be paid by the team and reimbursed by the league as a benefit, and will not impact the team’s cap sheet. Minimum salaries will be increased in the new agreement. For 2017-18, the minimum salaries of players of all tenures will increase by 45 percent (relative to the 2017-18 figures in the current agreement). For example, the minimum salary for a rookie will increase from $562,493 to $815,615, while the minimum salary for a 10+ year veteran will increase from $1.6 million to $2.3 million. For multi-year minimum-salary contracts, each subsequent year will increase by 5.0 percent of the 2017-18 salary for the corresponding year of service. Starting with 2018-19, the minimum salaries of players of all tenures will increase by the same percentage as the increase in the salary cap. For multi-year minimum-salary contracts, each subsequent year will increase by 5.0 percent of the then-current-year salary for the corresponding year of service. Existing rules on maximum free agent contract length will be retained in the current agreement. Free agents who sign with their current teams using “Bird Rights” can be signed for up to five seasons, while all other free agents can sign for up to four seasons. The maximum contract length of various extensions, however, will increase in the new agreement. The length of standard veteran extensions will be increased by one season (see “Veteran Extensions” below), and by two seasons for “Designated Veteran Player Extensions” (see “Designated Player Extension” below). The maximum annual raises and declines for players signed with “Bird Rights” or “Early Bird Rights”will increase from 7.5 percent to 8.0 percent of their first-year salaries, and from 4.5 percent to 5.0 percent for all other players. Waiting Period to Extend: Veteran extensions for contracts (other than rookie-scale contracts) of three to four years in length will now be permissible after two years from signing (vs. three in the current agreement). For five-year deals, extensions will still be allowed only after three years. First-Year Salary: The salary in the first year of veteran extensions (other than “Designated Veteran Player Extensions” as described below) will be increased from 107.5 percent of the player’s previous salary to 120 percent of the greater of (i) the player’s previous salary and (ii) the estimated average salary. Extension Length: Veteran extensions (other than “Designated Veteran Player Extensions” as described below) will be able to cover five total seasons (vs. four in the current agreement), as follows: four new seasons if one season remains on the current contract, or three new seasons if two seasons remain on the current contract. Veteran extensions for players with multiple seasons remaining on their contracts will no longer be able to be signed during the season. The new agreement will introduce a “Designated Veteran Player” concept, which is specifically designed to make it far more enticing for star players to remain with their current teams. The “Designated Veteran Player” concept will allow players who qualify to sign Tier 3 max salary contracts (that start at anywhere above 30 percent, but not greater than 35 percent, of the salary cap), even though they don’t meet the league’s tenure-based eligibility requirements for it. Such contracts must be for a full five-years, and can contain annual increases or decreases equal to 8.0 percent of the first-year salary. To qualify for it, a player must be entering his eighth or ninth season in the NBA (in the case of extensions) or have just completed his eighth or ninth season in the NBA (in the case of free agent signings), and must meet one of the performance criteria. Included on the list: Making one of the three All NBA teams in either the previous season or the prior two, winning Defensive Player of the Year in either the previous season or the prior two, or winning MVP in one of the previous three seasons. Such players must also have never changed teams as a free agent. They can have only been traded during their first four years in the league. They must be free agents (in the case of free agent signings) or have one or two years left on their contracts (in the case of extensions). They can only negotiate and sign them in the offseason (from July 1st to the day prior to the start of the regular season). And if it is an extension, three years have to have passed since they signed their original contracts. Teams will be restricted from signing players to “Designated Veteran Player” free agent contract or extension if they already have two or more such players included in their team salary. And any player who gets one of these contracts can’t be traded for at least a year after signing it. Also of note: Russell Westbrook and James Harden were grandfathered in to the new “Designated Veteran Player” extension rules even though they would otherwise not qualify. However, even if they do sign them, their “Designated Veteran Player” extensions would not provide a higher payout than they could otherwise get with a standard max contract in free agency. The “Designated Veteran Player” rules were designed to allow elite veteran players to be rewarded earlier for playing at an extremely high level, in much the same way that the current “Designated Rookie Scale Player Extensions” (which allow for extensions of up to five additional seasons) and “5th Year 30% Max Criteria” (which allows players with fewer than seven years of service to sign an extension with a starting salary between the Tier 2 and Tier 3 max) rules allow elite first-round draft picks to be rewarded for playing at a high level. “Designated Rookie Scale Player Extension” Changes: The number of Designated Rookie Scale Player Extensions that a team can have included in its team Salary at any point in time will increase from one to two. A team will continue to be limited at any point in time to a total of two Designated Rookie Scale Player Extensions (one of which could be acquired by trade). “5th Year 30% Max Criteria” Changes: The performance qualifications for players coming off rookie-scale contracts to receive “5th Year 30% Max” salary bump will be altered to conform to those for “Designated Veteran Player” contracts (as described above). The league has structured the new rules to seamlessly integrate into existing rules to ensure top-level players are always ahead of the curve with their pay, but only if they remain with their existing teams. A first-round draft pick would sign a four-year rookie-scale contract. He could then transition right to a five-year “designated player rookie scale extension” (and even tack on the super-max salary bump to a Tier 2 max contract if he meets the “Fifth Year 30% Max” performance qualification). He could then transition right into a five-year “Designated Veteran Player” extension if he qualifies. He could wind up being with his team for 14 years, potentially without ever having hit free agency. The deadline for entering into rookie-scale extensions will also be changed, from 11:59 p.m. (on October 31 to 6:00 p.m. on the day prior to the first day of the regular season. The NBA’s Over-36 Rule will be modified to be an Over-38 Rule in the new agreement. The Over-36 Rule was designed to close a potential salary cap loophole whereby an elderly player signs a contract with a lower average annual payout in exchange for a longer term that has him being paid into his retirement — a creative way of making his post-retirement salary a form of deferred compensation for services rendered during his playing days. The Over-36 Rule discourages this type of manipulation of the salary cap rules, by automatically frontloading the cap hit of certain four- and five-year deals. It essentially removed the cap hits associated with those final years and instead allocated them over the first years. For 32-year-olds, the Over-36 rules reallocated the fifth year of five-year deals. For 33- and 34-year-olds, it reallocated the fifth year of five-year deals, as well as the fourth year of four-year deals signed without Bird rights. For 35-year-olds, it reallocated the fourth and fifth years of any deals they signed. The Over-36 Rule doesn’t stop such players from signing the longer-term deals, but it doesn’t limit the payout on them. With more of the cap hit getting added to the first year, it becomes impossible to get a max deal. The post-allocation cap hit in the first year would blow past the max, which isn’t legal. Shifting the rule back two years, from Over-36 to Over-38, conveniently accommodates the likes of Chris Paul this summer and LeBron James next summer. Chris Paul has said he’s gunning for a max deal this summer. Under the old rules, he’d be eligible for a four-year, $162 million deal with the Los Angeles Clippers – not a substantial difference from the four-year, $155 million he’d be eligible for with any other team. With the new rules, he’ll be eligible for an extra year. That’s five years and $209 million, or $48 million more than the 32-year-old can get with any other team. And unless you can see a team paying a 36-year-old $48 million (if it were even possible), he’s not going to make it up on the back end. LeBron James gets the same benefit next summer. Under the old rules, he’d be eligible for a four-year, $162 million deal with the Cleveland Cavaliers. With the new rules, it’s five years and $219 million! Whether each player will be able to command such a max deal is unknown. But the new rules at least give them a chance to try. The minimum regular season roster size will increase from 13 to 14 players under the new deal. The maximum roster size will remain at 15. If teams cumulatively carry an average of fewer than 14.5 players in any one season, the minimum roster size will increase to 15 players for the following season. “Two-way contracts” can only be signed through January 15 of each season, and only for players with three or fewer years of NBA experience, and only if the player will have been on a “two-way contract” for three or fewer seasons upon completion of the contract. Players on “two-way contracts” could be brought up to the NBA club or sent down to its D-League affiliate at the NBA team’s discretion, but can only be on the NBA roster for up to 45 days (which is prorated if signed during the season). “Two-way contracts” can be for up to two years in length, and pay out the prorated NBA rookie minimum salary while the player is with his NBA team and a prorated $75K annual salary (increasing 3.0 percent each season after 2017-18) while with its D-League affiliate. Thus, the max payout for a player on a two-way contract (whose contract isn’t converted to a standard NBA deal) will be approximately $263K for 2017-18. “Two-way contracts” will not count against their NBA teams’ cap sheets. During the term of a “two-way contract,” the player will be eligible to sign a standard NBA contract only with his current team. The NBA team will have the option to convert a “two-way contract” into a regular minimum salary contract at any time. Upon completion of their “two-way contracts,” players would have cap holds equal to the minimum salary and could be made restricted free agents if a minimum-salary qualifying offer with reduced salary protection is issued. Bird rights and years of service will accrue for such contracts. Rookie Salary Cap Holds: Cap holds for first-round picks who have been drafted but not yet signed will increase to 120 percent of their scale amounts, vs. 100 percent in the previous agreement. Cap Holds of Players Coming Off Rookie-Scale Contracts: Beginning with the 2018-19 season, cap holds for first-round picks coming off their rookie-scale contracts will increase to 250 percent if their previous salary was at or above the estimated average salary, and 300 if their previous salary was below the estimated average salary. Under the current deal, the figures were 200 percent and 250 percent, respectively. Minimum Salary Cap Holds: Cap holds for players coming off minimum salary contracts, which are equal to the portion of the minimum salary not reimbursed by the league, will increase at the same rate as the minimum salaries themselves. Roster Charges: Roster charges, which are equal to the rookie minimum salary, will increase at the same rate as the rookie free agent minimum salary will increase. For 2017-18, the roster charge amount will increase from $562,493 to $815,615, a net increase of $253,122. The rise will alter the allocation of available cap space for all 30 teams next summer. When a team carries fewer than 12 players on the roster (including players under contract, free agents included in team salary, players given offer sheets, and first round draft picks) at any time during the offseason, a roster charge is automatically added for each player fewer than 12. The charges get removed when the team builds back up to 12 players. Since a team must now carry a minimum of 14 players on the roster to start the regular season, no teams can ever exit the offseason with roster charges remaining. Therefore, these charges do not reduce a team’s maximum available cap space. The salary cap will be set prior to the start of the Moratorium Period. The Moratorium Period will now begin at 12:00 AM on July 1st and end at 12:00 PM on July 6th each season. Match Period: The time for a team with a right of first refusal to match an offer sheet will be reduced from three days to two days. Moratorium Period: Restricted free agents will now be eligible to sign offer sheets as early as July 1st. A team holding a right of first refusal will have from the conclusion of the Moratorium Period until 11:59 PM on July 8th to match such an offer sheet. Qualifying Offer Withdrawal Deadline: The period of time during which a team can unilaterally withdraw a qualifying offer it has given to its restricted free agent will be reduced 10 days, from July 23rd to July 13th. Public Disclosure: Teams will not be allowed to publicly declare that they intend to match any offer sheet their restricted free agent signs with another team. While these changes all certainly help restricted free agents, none of them figures to have a material impact on (the lack of) restricted free agent movement. Teams that want to sign another team’s restricted free agent who has fewer than three years of experience are greatly restricted in what they can offer. The first-year salary can be no greater than the value of the Non-Taxpayer Mid-Level exception. The second-year salary can increase by the standard amount, now 5.0 percent. The third-year salary, however, can jump considerably — it is allowed to be as high as it would have been had the first-year salary not been limited by these rules. The fourth-year salary can increase by the standard amount, now 4.6 percent, of the third-year salary. Teams that offer the elevated third year salary must have cap room equal to the average payout in the contract to offer it, and the cap hits associated with the contract become the average payout if the prior team elects not to match. Prior teams must have room equal only to the first-year payout in order to be able to match such contracts. Under the current agreement, the cap hits associated with the contract become the actual payouts if they elect to match. This can potentially produce highly adverse salary cap scenarios in situations where the player’s cap hit rises sharply in the third year, and in turn potentially give the offering team a huge advantage not contemplated in the drafting of the current agreement. The new agreement addresses this issue, by allowing the prior team to elect whether to incur cap hits equal to the actual payouts or, if it has cap room equal to the player’s average salary, equal to the average salary. So, for example, if a player with two years of experience is signed to an offer sheet next summer, the first year salary can be no higher than the Non-Taxpayer Mid-Level Exception — that’s $8.4 million. The second-year salary can increase 5.0 percent — that’s $8.8 million. The third year salary can increase all the way to what it could have been had the first-year salary not been restricted — that’s an estimated $28.3 million at a projected $103 million cap. The fourth-year salary can increase by 4.6 percent — that’s $29.6 million. The total contract would pay out $75 million over four years. The offering team would need to have $18.8 million of cap space — equal to the average value of the contract — and the cap hits would equal $18.8 million for each of the four years if the prior team doesn’t match. The prior team would now have a choice on how to take their cap hits — either (i) $8.4 million, then $8.8 million, then $28.3 million, then $29.6 million or (ii) $18.9 million each year. Minimum team salaries will be calculated based on actual salaries paid in the new agreement, vs. based upon a team’s cap hit. This change will eliminate trade-deadline trades that teams utilize to legally skirt paying out of the amount of the minimum team salary. Traded Player Exception: The range for salary matching in trade will be increased. Teams that trade away up to $6.5 million in salary can take back up to 175 percent of the salary they trade away, plus $100,000 (as long as they remain below the tax threshold after the trade). Teams that trade away between $6.5 million and $19.6 million will be able to take back up to $5.0 million more than they trade away (as long as they remain below the tax threshold after the trade). Teams that trade away more than $19.6 million or that wind up above the tax threshold after the trade can still only take back up to 125 percent of the salary traded away, plus $100,000. Trade Exceptions: Trade exceptions will only be calculated based upon the guaranteed salary of the player(s) involved in the deal. If the trade happens after the end of the regular season, the following season’s salary will be utilized for purposes of calculating the trade exception. Cash in Trade: The amount of cash teams can send and receive each season will be increased from $3.6 million to $5.1 million in 2017-18. Starting with the 2018-19 season, the figure will rise or fall at the same rate as the salary cap. Trade Bonuses: Players and teams will be allowed to negotiate away trade bonuses as part of a trade. Previously, players could only negotiate away a trade bonus to the extent that doing so made a proposed trade legal (and then only up to the amount that would enable the trade to still be legal). If a team elects to stretch a player’s salary for cap purposes, it can no longer acquire that player until after the original term of his contract has expired. If a team agrees to a buyout of a player, it cannot sign that player (or acquire him off waivers) for one year. The new deal will contain significant changes to the regular-season schedule that are designed to reduce the number of back-to-back and four-games-in-five-nights stretches that teams currently face. The preseason will be shortened, and the regular season will start sooner and be lengthened to accommodate the schedule changes. The regular season will increase from 170 to 177 days. Player days off will increase from 16 to 18 days. New processes will be put for players with potentially life-threatening health conditions, such as that with Chris Bosh. Such situations will be referred to a three-physician panel (one appointed by NBA, one by NBPA, one by the other two appointees). The panel would clear the player for play only if, in their determination: (i) he is medically able and fit to play and (ii) playing doesn’t create a materially elevated risk of death. Even if the panel clears him for play, the team wouldn’t be required to play him. But if the player has multiple years remaining on his contract and the team refuses to allow him to play or practice, after 60 days (or on the following August 1 if the the 60-day period would extend past the trade deadline) the team could be forced to either: (i) trade him, (ii) agree to a buyout with him, or (iii) waive him (partial waiver claims would be permitted). If panel denies him for play, the player is essentially barred from playing basketball ever again unless the panel clears him. Either the NBA, NBPA or team can send him back to the panel after latter of first day of following season and nine months, but only if they have an executed letter written by a physician which states that something material has changed (e.g., about his health, about advances in medical technology, etc.). Other changes include a revised domestic violence policy, revised drug testing procedures and penalties, expanded health care benefits for retired players (the costs of which will be split, expanded benefits for current players), and the elimination of the single-use amnesty provision, among other things. Wednesday’s agreement ensures there will be labor peace for at least the next six years, a huge victory for players and teams alike for a league that is flourishing in the wake of a massive new television deal and strong momentum generated over the past several seasons. It also provides certainty – something players and teams both covet, as they plan and prepare not only for the present but also for their futures. If league continues along its current trajectory, it should be a bright future indeed. is there any exception in this new deal that will help the heat with the Bosh situation.